Computer colossus Dell came out on top for the second year in a row. 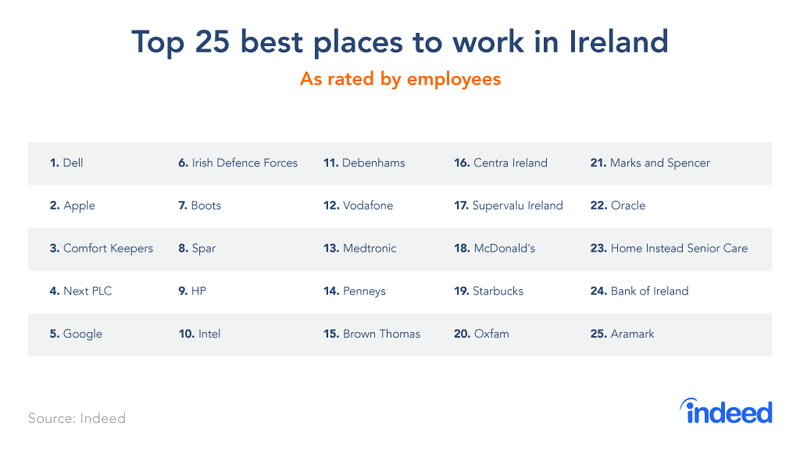 FOR THE SECOND year in a row, computer colossus Dell has been ranked the best place to work in Ireland by jobs website Indeed. The world’s largest company, Apple, claimed the number two spot while homecare specialist Comfort Keepers was ranked third. UK-based clothing retailer Next and online giant Google rounded off the list of the top five companies to work for, according to employees. Indeed’s index is based on employee reviews submitted to the website. The findings were only based on Irish reviews that large companies received. While multinational companies got thousands of global reviews, a much smaller number of those were counted for the Irish ranking. Indeed uses an algorithm to rank companies across a number of categories including the average employee rating, the number of reviews and the history of job openings. A number of outfits listed in the top 25 slipped down the rankings compared to 2017′s findings. For example, poverty charity Oxfam – which is investigating dozens of cases of alleged sexual misconduct – dropped from third position to number 20. Several firms that featured last year were absent from 2018′s list, namely PayPal, Argos, Boston Scientific, TK Maxx, Tesco, IBM and Accenture. The Irish Defence Forces, a new entrant, was listed at number six. It recently announced plans to add 480 people to its 9,500 workforce across the army, naval and air corps services. Medtronic, Brown Thomas, Oracle, Home Instead and Aramark also made it into this year’s top 25. Commenting on the index published today, Indeed senior vice president of human resources Paul Wolfe said there is “intense competition” among employers as Ireland reaches full employment. Wolfe said companies have recognised that employee satisfaction isn’t just linked to remuneration. Staff value good work-life balance, flexible working options and a “collaborative working environment”. “This is evident in the companies we have ranked today,” he said.